I shot this photo of a cobalt blue bottle tree one winter while I was taking a little road jaunt with my friend Connie, somewhere up near Adairsville, Georgia. It’s funny, sometimes when I mention bottle trees in a conversation, people don’t know what I’m talking about – so maybe this is your first one too, and I’m glad I could introduce you. I’m not an expert on the history of bottle trees, but I’ve always heard they came to the Southeast from Africa, a by-product of the slave trade. The belief was that marauding spirits would get trapped in the glass bottles overnight, and then be vaporized by the sunlight before they could cause any mischief. Think of the genie trapped in Aladdin’s lamp – it’s all part of the same folklore, going back many centuries to Arabia and the Middle East. 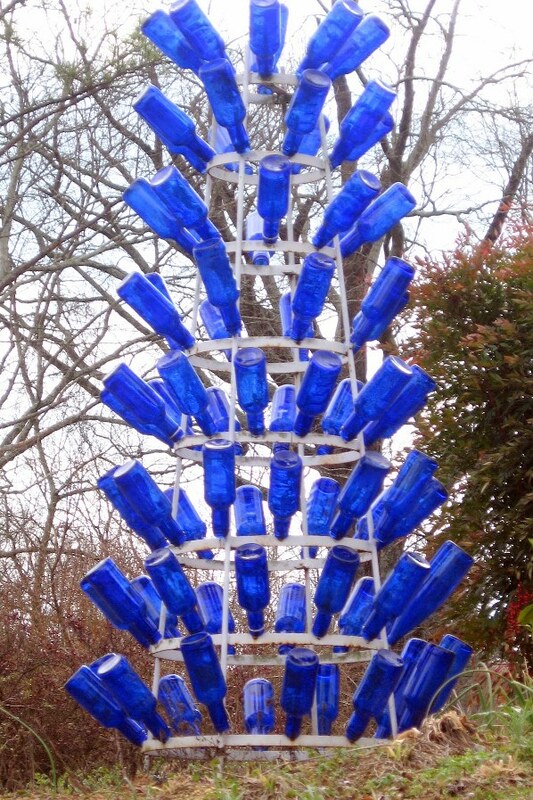 One of my favorite garden writers, Felder Rushing, has researched bottle tree history thoroughly, and you can read all about it on his website. He also has a bottle tree gallery that contains over a hundred photos, which he’s taken on four different continents. It’s highly recommended, very entertaining, and you don’t want to miss it – the link will open in a new window, for your viewing pleasure. Back in 2006, the famed glassmakers on the Venetian island of Murano put together the world’s largest glass Christmas tree. Reportedly, the sections were all blown individually, then bolted together. 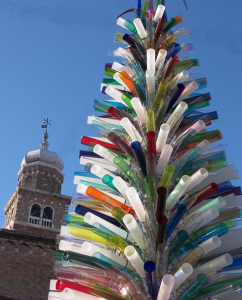 It sat in the town’s Campo Santo Stefano through the holiday season that year, and is now in the Murano Glass Museum. The pictures are just beautiful – and it looks very much like a Southern bottle tree to me, although on a grander scale. 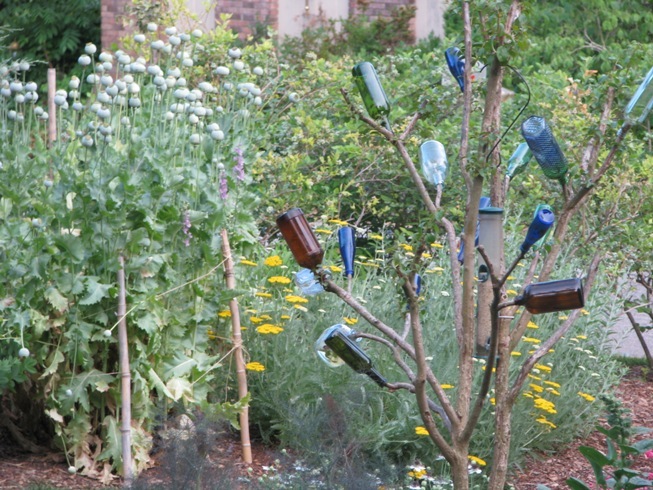 If you’re inspired to build your own bottle tree, you’ll be glad to know that you don’t have to fabricate a metal base on your own. You can order the “tree” itself from any of the sites below, and they come in all shapes and sizes.